The Boulder Reservoir has the unique beauty of spending a day at the beach while gazing at Colorado’s majestic mountains. It offer the convenience of a concession stand at the swim beach, lifeguards, showers, restrooms and close-in parking. And since you can reserve picnic areas, this reservoir is perfect for big gatherings with family or friends. It offers rentals for the volleyball court, boats, canoes, paddleboats and even horseshoes and bocce. After a relaxing and fun day at the beach, the city of Boulder offers some of the most unique and amazing restaurants. The Pearl Street Mall is a must see in the evening. 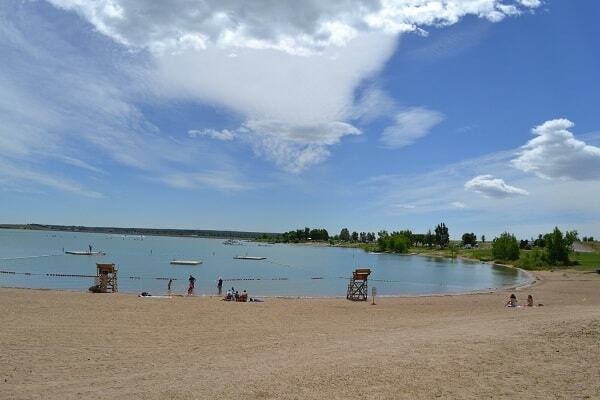 Boulder Reservoir is about 45 minutes northwest of Denver, but it can get busy in the summer, so if you’re heading out for a day trip, be sure to start early and claim your patch of sand. While this isn’t exactly a camping beach, it is a popular spot for locals, who come here to boat, swim, kayak, ski, and picnic. There’s even a supervised swimming area with a lifeguard on duty (which you won’t find at most other beaches in Colorado).